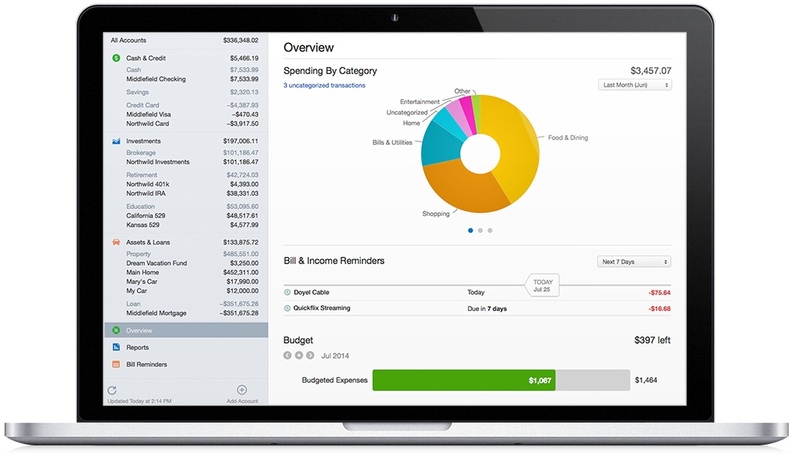 Quicken 2016 3.1.0 – Complete personal finance solution. Now you can export Category Summary and Tax Schedule reports to a CSV file (compatible with Excel, Numbers and other spreadsheets). We've received a lot of requests for this one. Enjoy! Mac-Only Quicken Windows file conversion and import! * Now, finally, you can convert your Quicken Windows files (.QDF files) to Quicken Mac 2016 without Windows! The Windows to Mac conversion and file import now happens seamlessly on your Mac. No need to have access to a Windows computer or create a transfer (.QXF) file. All you need is your Quicken Windows (.QDF) file. * Note that this Mac Only import process is not currently available to customers who purchased Quicken for Mac 2016 in the Mac App Store. Apologies to our App Store customers. We are currently investigating whether we can bring the new file conversion process to the App Store version. In the meantime, App Store customers can continue to use the existing File Conversion Utility. Improved error reporting on the Account Status window. If you run into problems, the Bill Pay error message now links directly to the appropriate Help topic. You can now setup a Scheduled Transaction to be a Bill Pay transaction (without getting that weird "%@ Is Not Enabled" error). Note: This is still just a Scheduled Transaction (a reminder in Quicken). You still must Enter and the Send the transaction when your bill becomes becomes due. Creating the Scheduled Transaction alone does not send any Bill Pay instructions to your Bank. Fixed an issue where a transaction could be shown as "Sent" but also in an Error state. (That's confusing! thanks to Jim from Quicken Live Community for pointing this out). Fixed text on the Online Payments tab in the register that said "Processing" for transactions that were actually "Paid". Online Bill Payment check numbers now display in the Check Number field (Thanks Beta tester, macuser_22). Note that not all banks return a check number. Quicken 2007 files that previously had Bill Pay transactions in an Error Recovery state can now be imported (thanks to Beta tester, deanesfield). Online Transfers are now included on the Send Payments window. Switching from a Quicken Connect to Direct Connect. Switching from Direct Connect to Quicken Connect. Importing a QFX file and then connecting via Quicken Connect. "Clean up payees" preference is now respected for Quicken Connect accounts (Thanks to Beta tester, kbw4). Fixed an issue where transaction download could time out before completing. Fixed an issue where some customers saw a "generic error" when attempting to download. Fixed an issue where some customers received "Error 185" even after entering correct credentials to an MFA challenge. Fixed an issue where customers of Direct Connect banks that require a PIN change on first use were being prompted to change their PIN more than once. Reconcile Starting and Ending Balance no longer defaults to a negative number. Note that you should always enter positive numbers (no negative signs) even in Credit Card accounts. Using a negative number will make it impossible to reconcile properly. Big thanks to all of you that brought this to our attention. Scheduled Transactions should now match to downloaded transactions! Transactions entered in manual accounts will no longer display the "Manual transaction" pencil icon (since all transactions are entered manually). Fixed an issue where Reinvest Dividend transaction totals were inflated in the exported TurboTax (.TXF) file (thanks to gNeil and JM in Quicken Live Community). Fixed an issue where account values could mysteriously disappear in the sidebar (thanks Beta tester, ctquinn). Fixed an issue where past due Scheduled Transactions did not always display in the Calendar. Fixed an issue where the Import option for Quicken Essentials and Quicken 2015 files was not working properly. Fixed an issue where Opening a Quicken Essentials or Quicken 2015 backup didn't always perform the correct setup steps. Fixed an issue where importing a Quicken 2007 account could result in transactions going to wrong register. Fixed an issue where shares for Option transactions could be incorrectly calculated. Fixed an issue where importing an Investment QFX file could result in only placeholder transactions being imported. Fixed an issue with the display of Investing quotes "Last Updated" time on the Portfolio view. Fixed an issue where Day Change on the Portfolio view showed in the wrong color if the account had a negative balance. Fixed an issue where Day Change and Today's Gain/Loss amounts on the Portfolio view were not getting updated if two securities had the same ticker. Next story Eagle 7.5.0 – Schematic capture and printed circuit board design. Previous story SMART Utility 3.2.2 – Checks the hardware diagnostics system of hard drives. Moneydance 2015.3 – Personal finance manager. StockSpy 1.2.1 – Track stock market news.